Have you started thinking about taking your company public? 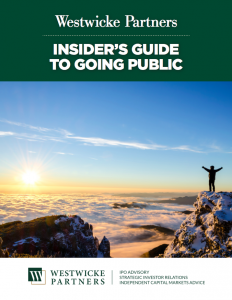 If so, then our new eBook, Westwicke Partners Insider’s Guide to Going Public, is for you. Going public is a daunting task, with much at stake. Most executives dream of seeing the business they built trading shares on Wall Street. But there are many ways a public offering can go wrong. All of it is yours with our compliments. Just fill out the form, click download, and enjoy. The first step to leading your company to a successful IPO is to educate yourself on the process. There is much to know, so download our free eBook today.